Adopted in 2018. 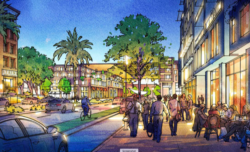 CDI was responsible for the public involvement process for the 55-acre specific plan for transforming the Vallco Shopping Mall into the new town center for Cupertino, CA, home of Apple Inc. The project had a long history of contentious politics. Opticos and CDI successfully engaged hundreds of community leaders and members in two, week-long charrettes. The result was a Specific Plan that was adopted by City Council. Comprehensive Plan draft completed for public review. CDI was responsible for the development of the public involvement and local capacity-building process for this city-wide comprehensive plan project. CDI trained Memphis staff and three local firms to facilitate a year-long set of meetings and charrettes across the city. Completed in 2016. 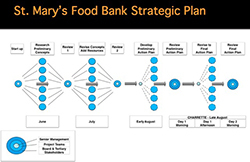 NCI used the NCI Charrette System to facilitate a top-down, bottom-up restart of the stalled strategic plan for the oldest food bank in the U.S. The result was not only an activation of a set of five initiatives but also a transformation for how the organization’s leadership and staff work together. Completed in 2015, a vision plan for the 21-mile Michigan Avenue/Grand River Avenue corridor. The plan included seven jurisdictions a major hospital complex and Michigan State University. 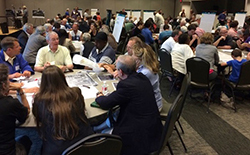 The Tri-County Regional Planning Commission adopted the plan on the last day of the charrette. Sparrow Hospital began a major expansion in accordance with the plan within months of the completion of the plan. Completed in 2015. NCI lead a team to help the Memphis community come together to provide a voice to the ULI panel concerning the controversial repurposing of the Fairgrounds site. NCI facilitated four public workshops across the city and created a website to gather public input. In total over 600 people participated online and in the events. The results were summarized in a report that was delivered to the ULI panel for use in their study of the Fairgrounds site. Completed in 2013, a neighborhood plan for the disinvested social services area north of Downtown Denver. 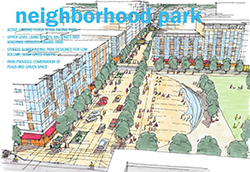 The plan featured architectural and urban design strategies for integrating social services into a mixed-use neighborhood. 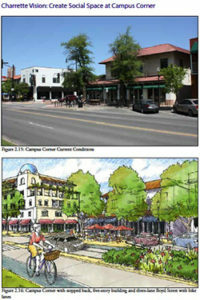 The resulting plan became a component of the Denver Downtown Plan approved by City Council. Completed 2014. NCI was asked to facilitate a civil community process for a contentious debate over the form of neighborhood infill projects. NCI was able to reestablish trust among the parties though a series of tours, meetings, interviews and a five-day charrette. The resulting Form-based Zoning Code was approved by City Council. © 2017 Collaborative Design + Innovation, LLC. All right reserved.